Junior Field Engineer (New Graduate) - Capital Paving Inc.
Do you want hands on field experience? Want to learn, and grow within an organization where you are not just a number? As a Junior Field Engineer with Capital you can have hands on experience and training in both the construction and aggregate divisions. You will benefit from the support and mentorship of our seasoned Professional Engineers. 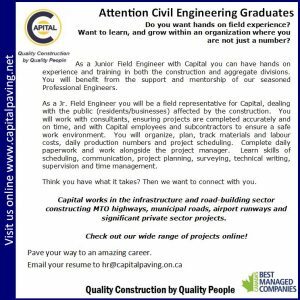 As a Jr. Field Engineer you will be a field representative for Capital, dealing with the public (residents/businesses) affected by the construction. You will work with consultants, ensuring projects are completed accurately and on time, and with Capital employees andsubcontractors to ensure a safe work environment. You will organize, plan, track materials and labour costs, daily production numbers and project scheduling. Complete daily paperwork and work alongside the project manager. Learn skills of scheduling, communication, project planning, surveying, technical writing, supervision and time management. Think you have what it takes? Then we want to connect with you. Capital works in the infrastructure and road-building sector constructing MTO highways, municipal roads, airport runways and significant private sector projects. Check out our wide range of projects online!